Pen and ink drawing by Frederic Peter Layard (1818-1891), from an earlier sketch of March 1839, of a mosque and village near Rajmahal in the Punjab in Pakistan, dated 1843. 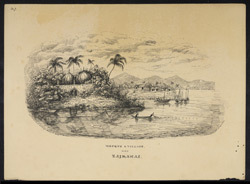 The image is inscribed; 'Mosque & village near Rajmahal. Ecet on the River Suttledge. October 20 1843. F.P. Layard Skd. March 1839'. Rajmahal is located along the right bank of the Ganges in Bihar. In 1592, it was chosen as the capital of Bengal by Man Singh, a Rajput general who worked for Mughal Emperor Akbar (r.1556-1605). Rajmahal remained the capital until 1607, when it was shifted to Dacca. Sultan Shuja, the governor of Bengal, moved the capital back to Rajmahal in 1639. The capital was shifted again in 1707, this time to Murshidabad.